Three-dimensional (3D) models are often utilised to assess the presence of sand and gravel deposits. Expanding these models to provide a better indication of the suitability of the deposit as aggregate for use in construction would be advantageous. This, however, leads to statistical challenges. To be effective, models must be able to reflect the interdependencies between different criteria (e.g. depth to deposit, thickness of deposit, ratio of mineral to waste, proportion of ‘fines’) as well as the inherent uncertainty introduced because models are derived from a limited set of boreholes in a study region. Using legacy borehole data collected during a systematic survey of sand and gravel deposits in the UK, we have developed a 3D model for a 2400 km2 region close to Reading, southern England. In developing the model, we have reassessed the borehole grading data to reflect modern extraction criteria and explored the most suitable statistical modelling technique. The additive log-ratio transform and the linear model of coregionalization have been applied, techniques that have been previously used to map soil texture classes in two dimensions, to assess the quality of sand and gravel deposits in the area. The application of these statistical techniques leads to a model which can be used to generate thousands of plausible realisations of the deposit which fully reflect the extent of model uncertainty. The approach offers potential to improve regional-scale mineral planning by providing an enhanced understanding of sand and gravel deposits and the extent to which they meet current extraction criteria. This paper is published with the permission of the Executive Director of the British Geological Survey (NERC). It was funded by BGS National Capability funding from NERC. Contains Ordnance Survey Data © Crown copyright and database rights . Ordnance Survey Licence no. 100021290. The authors would like to thank Dr. David Malone, Andy Kingdon, John Williams and another anonymous reviewer for constructive reviews which have greatly improved this manuscript. Maps were created using ArcGIS® software by Esri. ArcGIS® and ArcMap™ are the intellectual property of Esri and are used herein under license. Copyright © Esri. All rights reserved. For more information about Esri® software, please visit www.esri.com. Geostatistical models are commonly used in the mining industry to interpolate 2- or 3D predictions of a deposit and to quantify the uncertainty of these predictions. Standard geostatistical models can be estimated and manipulated within software packages such as GOCAD . This appendix summarises the statistical theory required to understand our modelling methodology. Fuller theoretical descriptions of all of these methods with the exception of the techniques for compositional data can be found in accessible textbooks such as . The technical aspects of the spatial prediction of compositional properties are described by . Environmental properties are often spatially correlated. This means that observations of such properties made a short distance apart are more likely to be similar than disparate observations. Geostatistical methods quantify and use this spatial correlation to predict the value of the property at a location where it has not been observed and to calculate the uncertainty of this prediction. Here, x is a location at which the property is observed, h is a lag vector and E[…] denotes the expected value of the term in brackets. The variogram describes how the expected squared difference between a pair of observations varies as the vector separating them is changed. The variogram might vary according to both the direction and magnitude of h. Such a variogram is said to be anisotropic. If the variogram is isotropic then the h in Eq. 1 is replaced by the magnitude of the lag vector which we denote h.
This point estimator applies to the isotropic case xj, 1 and xj, 2 denotes a pair of observation locations approximately separated by lag distance hi and m(hi) denotes the total number of such pairs of points. Then, a parametric function is fitted to these point estimates by a least squares approach. Several suitable parametric functions exist. The highly flexible Matérn function is often advocated . This function has four parameters: a nugget, c0, which is the variance of the spatially uncorrelated component of the property; a sill, c1, which is the variance of the spatially correlated component, a spatial parameter, a, which reflects the distance over which the property is spatially correlated and a smoothness parameter, ν, which describes the shape of the variogram. One disadvantage of the method of moments approach is that the fitted model can be influenced by the seemingly arbitrary selections of the set of lag distances at which point estimates are calculated and the tolerance on pairs of points which are considered to be approximately separated by these distances. Also, the method of moments approach does not account for correlations between the point estimates for different lag vectors. These issues do not arise if the variogram is estimated by maximum likelihood . If the observed property is assumed to be a Gaussian random variable, then it is possible to calculate the likelihood that the observed values would have arisen from a random function with a proposed set of variogram parameters. The maximum likelihood estimator uses a numerical algorithm to find the parameter values that lead to the largest likelihood value. The maximum likelihood approach is considered to have statistical rigour, but for complex spatial models, it is a numerical challenge to find the parameter values which lead to the largest likelihood. If the assumption of a Gaussian variable is inappropriate, then a transformation can be applied to the observed data. Once a parametric estimate of the variogram is available, the value of a property can be predicted at a site where it has not been observed by kriging. The kriged prediction is a weighted sum of the values of the property observed nearby. The weights decrease as the distance between the observed value and the prediction site increases in a manner that is related to the fitted variogram function. The kriging approach also calculates the variance or uncertainty of the prediction. It is also possible to use the fitted variogram to simulate realisations of a spatially correlated property at each node of a grid. Each realisation will contain realistic patterns of variation and the differences between the realisations will reflect the uncertainty of the predictions at each grid point. Several geostatistical simulation algorithms exist  but we favour the lower-upper (LU) approach which can quickly produce a large number of realisations. The primary drawback of this approach is that a set of realisations on a grid with n nodes requires the Cholesky decomposition of a n × n matrix. This is a relatively computationally intensive matrix operation which is impractical, on a 32 GB RAM computer running Matlab, for n > 15,000. Here, hx and hyare the distances separating a pair of points in the two lateral directions, hz is the vertical separation and α > 0 is a model parameter. When α = 1, the model is isotropic. Other values of α lead to the vertical range being stretched or contracted in relation to the horizontal range. Such a variogram model can be estimated using either the method of moments or the maximum likelihood estimators. The method of moments approach requires separate point estimates of the variogram to be produced for pairs of points that are separated vertically, horizontally or in both directions. An estimated LMCR can be used to krige and simulate multiple spatial properties in the same manner as the univariate case. and any shift in g4 should be subtracted. This approach ensures that the simulated gradings at each site sum to 100% and that these simulated values honour the spatial and between-grading correlations observed in the borehole data. It is important to confirm that the predictions from geostatistical models are consistent with the observed data. 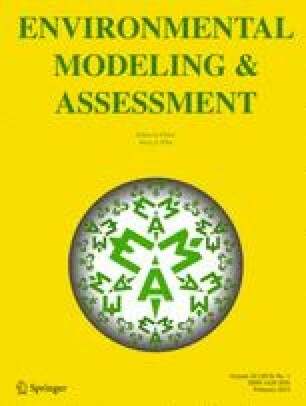 Discrepancies between observed and predicted values can occur if the models are based on inappropriate assumptions or if the model estimation procedure does not work correctly. Ideally, a substantial proportion of would be held-back from the model calibration procedure for such validation of the model. More generally, a cross-validation procedure is employed where a small number of observations are held-back and the remainder are used to predict the property of interest at the locations of the held-back data. Then the process is repeated, holding back a different set of observations each time, until cross-validation has been performed at a substantial number of locations. Quantities such as the mean of the predicted value minus the observed value can be used to confirm there is no bias in the predictions. It is also possible to test whether the uncertainty in the predictions has been appropriately modelled. This is achieved by calculating the standardised squared prediction error (SSPE) for each cross-validation site. This quantity is defined as the squared difference between the observed and predicted values all divided by the prediction variance. If the model errors are realised from a Normal distribution then the SSPE should be distributed according to a chi-squared distribution and hence it is possible to determine the probability (according to the geostatistical model) that such an error as extreme as this will have occurred. These probabilities might then be presented in an accuracy plot  which shows the proportion of cross-validation predictions that fall within any specified confidence interval. Chambers J.E., Wilkinson P.B., Weller A., Meldrum P..I, Kuras O., Ogilvy R.D., Aumonier J., Bailey E., Griffiths N., Matthews B., Penn S. and Wardrop D. (2012) Characterising sand and gravel deposits using electrical resistivity tomography (ERT): case histories from England and Wales. In: Walton, Geoffrey; Hunger, Emily, (eds.) Proceedings of the 16th extractive industry geology conference, held at the University of Portsmouth 8th to 11th September 2010. Extractive industry geology conference, 166–172. http://nora.nerc.ac.uk/id/eprint/20301/1/19__Chambers_166-172_pdf.pdf. Waters C.N., Terrington R.L., Cooper M.R., Raine R.J. and Thorpe S. (2016) The construction of a bedrock geology model for the UK: UK3D_v2015. British Geological Survey, 22. Open report (OR/15/069) (http://nora.nerc.ac.uk/512904/).